It is the perfect time to enter the European Market! Europe is a large and very interesting market. Many North American companies have started and are maintaining very successful businesses in Europe. Europeans like American products and with the right strategic approach you can generate new revenue streams. Our focus is to support small and medium sized industrial / technology companies. With an office in the US and one in Switzerland we are perfectly prepared to support our clients in their market entry to the European market. Norwin as a Swiss citizen and US permanent resident lives and works in the US since 2005. He knows both sides of the market very well. His experience is based on Executive roles in multi billion cooperations as well as Entrepreneurial experience with Start-Up’s. Andreas is very well connected in the European market. As a former Minister of Economic Affairs in the Canton of Berne (Switzerland) he is able to open may doors and provide a huge network and a wealth of knowledge. Please try us out! We are happy to discuss the best possible entry strategy tailored to your target-market, your needs, expectations and budget. We can introduce you to potential customers, we can evaluate market volumes, support your marketing strategies, search possible local partners or manufacturers and much more. Please contact us and we are happy to discuss your plans. 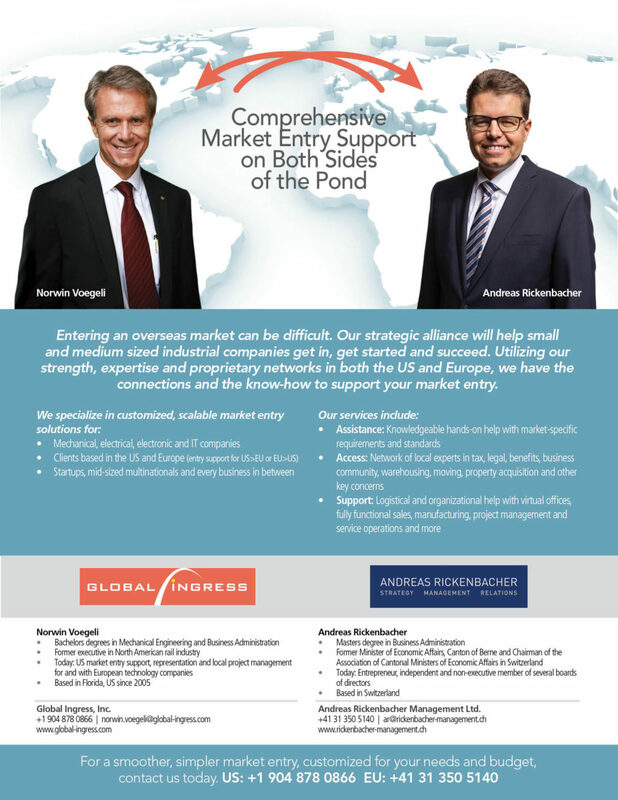 To learn more about Entering the European Market please contact us.